This article is about the choices of going to a 2.35 Constant Image Height system that are not readily discussed by anyone out there in the mainstream media or the salesman in the store (who really has your best interests at heart after all). Up until just recently, there really was only one choice for doing this and it was to go the anamorphic lens route where an externally mounted lens slides in front of the projector and out of the way when not needed. Depending on the quality of the lens, the cost of this option usually could be from $2000 to $8000 or even more. The lenses are priced similar to what one finds in the camera world as better quality glass always costs more money. As a quick aside, there are no real 2.35:1 films out there as most widescreen aspect films are actually shot at 2.39:1, but over the years, a typo somewhere made it 2.35:1 to the general public and somehow it stuck, but it really isn’t 2.35:1. If one orders a 2.35:1 aspect ratio screen, that is a mistake since most films will not fit it properly. A 2.39 or 2.40 screen will work better here. A new option has started to show up now for those that want the “2.35” option at home. Panasonic was the first to have the feature built in and it was called “Zoom Memory.” Often labeled the “Poor Man’s Anamorphic,” this feature is starting to show up on more and more higher end projectors as well, most notably the Epson models. Frankly speaking, this was the only feature I found to be fascinating on the Panasonic projectors since I did not like their performance in most other picture quality areas. That said, the zoom option showed promise. The premise of a zoom option is not that strange as the projector simply needs a zoom range that can both accommodate a 16:9 film and then a 2.39 film by zooming the image out to the edges of the 2.39 screen. The height of the image remains constant. This is often referred to as “Constant Image Height.” When the image is zoomed out, the projector can matte off the areas of the image that spill onto the top and bottom walls of the room given that the projected image is still 16:9 even if the screen might be 2.39. Nothing is missed there as only the black bars on the film are matted off. Proper placement of this type of projector is paramount as the hard matting does not work properly if too much lens shift has already been used in the installation of the projector. Let’s examine what an anamorphic lens system does to the image. A typical 2.39 film mastered for Blu Ray does not fully occupy the 1920×1080 pixel array of the format. Parts of the image are actually allocated to displaying the black bars of the film so 2.39 films are actually less of a space pig compared to a typical 16:9 presentation of a TV show or film (the stuff that fills the screen). About 810 lines out of the full 1080 lines are actually used for real picture information. This is plus or minus some as the aspect ratios of different films will vary on disc a bit too. Sometimes they do transfer a 2.39 film to 2.35 on the disc. 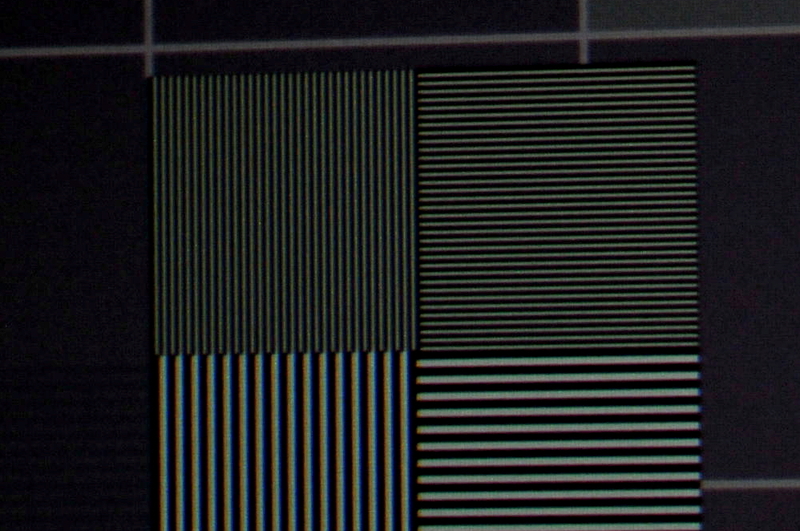 The area on the 1080p chip in the projector that is black is essentially unused. The anamorphic lens process would take the original image and vertically stretch the image to crop out the black bars on the top and bottom. At this point, the real detail that is on the 810 lines is now spread out over the full 1080 surface of the 1080p chip. This makes everything look skinny and tall in the image. (Just like the enhanced for 16:9 DVDs when played on a 4:3 TV back before they stopped making those TV sets.) 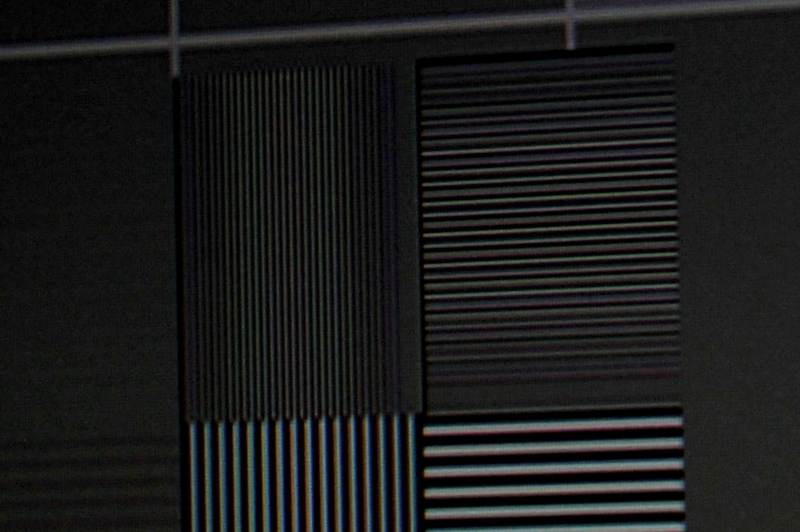 When this image is sent through the anamorphic lens parked in front of the projector, the image distortion is corrected and a proper image fills the 2.39:1 screen. The lens essentially stretches the image left and right to remove the skinny people effect. Let’s examine what a zoom memory system does to the image. The Dark Knight – Warner Bros.
A Zoom Memory system simply keeps two memory positions for the focus and zoom points on the lens. One memory would be set for the 16:9 image and the second one would be for the 2.39:1 image – which requires a different zoom position on the lens and a new focus setting as well as some lens shift too. In the above image, the item on the left is the film as seen on the disc in all its 810 line glory and how it would look on 16:9 screens everywhere. On the right is a 2.39:1 screen and you just see a bit of it peaking out on the left side. 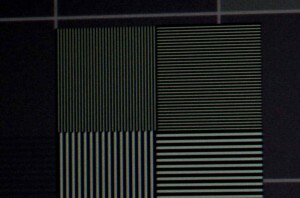 To make this film fit the screen, the image is zoomed out large so that the black bars now overshoot the top and the bottom of the screen itself. They spill onto the screen frame and the wall. The projector then uses either physical mattes to cover these black bars or it simply turns off the pixels on the chip. Matting is still needed since there is always light spill from the bulb in the projector so blacks are never really black. With this method, less of the 1080p chip in the projector is used so there is some drop in light output compared to the anamorphic lens method … or is there? When the projector is asked to vertically stretch an image to remove the black bars on the top and bottom, this requires the projector to process the picture and processing always degrades the image (for more information on this, read the article on 1080p resolution elsewhere on this site). The vertical stretch process can degrade visible detail in the image by effectively 50%. Two million pixels of detail become one million pixels of detail. With only 1.56 million pixels of real detail to begin with on a 2.39 film, the stretching process degrades the image detail to roughly 780,000 pixels of detail. It’s 720p quality now and the image is noticeably softer than when it started out. Good processing is a must here and I have only seen one projector that did not degrade the resolution and that was on a Runco D73 double stack system that runs $75,000. Zoom memory does not have this issue so one to one pixel mapping is retained. Below are three images of a resolution pattern when the vertical stretching is used and the original pixel perfect pattern when processing is done well. I’ve seen a lot worse (Third image) … but it rarely gets better than this. This is not bad at all, but the blurring effect is there … at the pixel level. When you lose 1:1 pixel mapping, things like moire pattern artifacts and rainbows could be created as well. 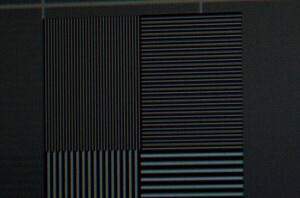 Additional issues with anamorphic systems include lens distortions like barrel type distortion, pin cushioning, spherical aberration (focused in center, not at outsides), and chromatic aberration (per-pixel color shift). A curved screen is needed to avoid some of these issues if the projector is mounted too close to the screen. Zoom memory projectors do not have this geometry consideration. As for light output, the Lord giveth and the Lord taketh away. The extra light coming out of the projector lens is spread out over a larger screen surface. This light is also sent through an additional piece of glass that further reduces light output. Anamorphic lenses have their own color properties and will require a separate white balance setting to be done. Anamorphic lenses that move in and out of position may need alignment over time. They may also affect the alignment of the projector image as well. When the image is zoomed out to fill the width of the 2.39:1 screen, there is no processing of the image, just a physical zooming and repositioning. There is no loss of detail in this image due to processing so 1.56 million pixels of real detail will still make it to the screen. The image will be crisper and more detailed than with an anamorphic lens. The zooming of the image also means that the expanded image takes up more space on the physical lens itself. From the understanding of camera lenses, images are best when using the center part of the lens. The lens quality begins to suffer as images approach the edge of the lens. Too much lens shifting on the projector will display the 2.39:1 image on the lower quality portions of the projector lens. 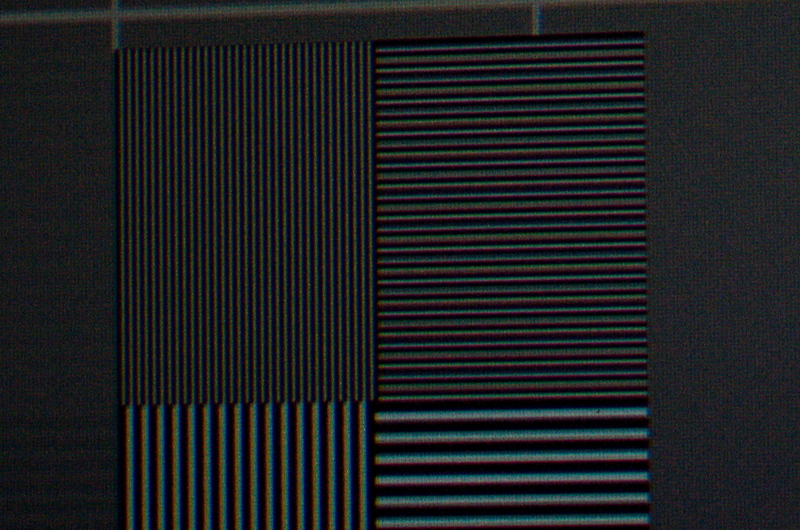 Some chromatic aberration may become visible in the form of apparent pixel misalignment. Lens Memory may not be solid since there is physical movement of parts, so things like focus creep and image creep may occur over time. The focus will change and the image may need to be re-centered over time. Second grayscale is not needed since no additional lenses are used to discolor the image. Light output will be lower coming from the projector due to fewer pixels being lit up, however, there is no additional light loss due to the anamorphic lens since that lens is not needed. Exactly how will the light loss from the lenses compare to using less pixels? That answer is still forthcoming. I will be taking readings from an Epson projector that will be using both an anamorphic lens and zoom memory. The first set of results are in. A calibrated 2.39 image via the anamorphic lens delivers a measly 1.4% more light output to the screen. This first test came from a JVC projector on the same screen and same viewing conditions. The lens used was a $6000 Schneider lens. This 1.4% difference cannot be seen by the human eye. It is like going from 100 light bulbs in a room to 98 bulbs. The second set of results are in; this time with the Epson and a Panamorph system. The difference this time is 9% in favor of the Panamorph lens versus the zoom memory on the same projector. This is more than on the JVC, but still below the visible threshold. The eyes are simply not sensitive to this type of difference. The human eye can readily detect light output changes closer to a 30% difference. They cannot see this type of difference in light output performance. But the difference between a 720p image and a 1080p image is easier to see given normal viewing distances. Hmmm … the same light output performance and a more detailed/crisper image and less money since no additional lens is needed. Subtitles on films may be in the black bar area and not visible. Disc menu systems are designed for 16:9 displays and may not display correctly on 2.39:1 screens. 3D, with its low light output through the 3D glasses will further affect light output of the 2.39:1 constant image height image. Perforated screens and 2.39:1 screens do not work well together. Light bulb performance will be reduced to 800 hours based on a 2000 hour bulb as it gets too dim past the 800 hour point. Perforated screens drop maybe up to another 10% of light output (depending on the holes) as well as decrease visible resolution. (Makes weaved screens a better choice.) Now how this actually plays out in a person’s home is entirely up to them. Deciding when an image is too dark is a very personal decision and if a person thinks the image is fine at 1500 hr on a 2000 hr bulb, who am I to say it is too dark. The decision is often driven by the loss of dynamic range in the image. Think contrast ratio. The placement of the black bars, even for similar 2.39:1 films, is not consistent from disc to disc. 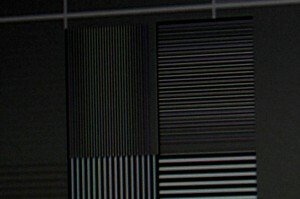 As a result, a sliver of the black bars will still be visible on the top of the screen or the bottom depending on the film in Constant Image Height systems. Each system has its strengths and weaknesses. The zoom memory system may be the poor man’s anamorphic system, but it also looks to have better overall quality than the actual anamorphic lens options. Less money and better image quality that makes it to the screen; not a bad deal and not always what a salesman wants to hear. While there is no Holy Grail perfect system, there is something inherently wrong with spending all this money on projectors and screens and lenses and having to accept something as low as 720p quality (or something less than what zoom memory does, but better than 720p). So on the side of the anamorphic lens option is more light output … which might be really tiny, like a 2% difference … or a bit more like a 9% difference. Certainly no where near that 30% manufacturer claim (see below on how they actually obtained that number). On the side of the zoom memory option is a crisper more detailed image … which might be a bit better than the lens option (where it is really hard to tell) or a whole lot better (600,000 pixels better) than the lens option. Also don’t have to deal with rainbow and moire issues. Of course the Zoom option is the lower cost option because it comes with most projectors today so it is pretty much free. The lens option is still $2000 to $7000 or more … And that’s real money. Now if that kind of money is nothing to you, then buy away. And once you buy the lens, you are invested and you have to use it and then by default it is therefore the winner. I personally don’t do either system nor care to, but I would likely start out with the zoom option because it is “free” and add the lens option down the road if I figured I needed more light output. But then again, I’d want to test my lens options to know that I am gaining enough light for it to make a difference that I can really see rather than something just on paper. Addendum … June 1, 2012. I started to notice these fixed lens anamorphic systems starting to hit the market. Instead of the lens sliding in the image path and then out of the path for 16:9 viewing, it stays fixed all the time. It got me thinking what is happening. I had a recent client in Toronto that was doing something similar with his Runco DLP projector set up and I threw up a resolution chart to see how much real resolution survived this process. Resolution / image detail drops by half when the projector does the vertical stretch mode in anticipation of the lens coming into place. 2 million pixel images become 1 million pixel images. Now take that 1 million pixel image and rescale the image again to fit a 16:9 image within the confines of a 2.35 screen surface. That 1 million pixel image is now further degraded to less than 750,000 pixels. This is progress? Sure it still looks better than DVD, but not by much anymore. The real number of visible detail is now in the 500,000 to 680,000 pixel range when looking at the resolution charts. All this for the sake of convenience. And whatever happened to the argument about using more pixels on the panel than the zoom memory method. Completely out the window. On a separate note, I got a chance to look at one of the new JVC projectors recently and it was set up with an anamorphic lens. With the e-shift technology, the image still retained full resolution going through the lens. I was pleasantly surprised to find that. Fantastic writeup Michael. Just another little advantage of zoom that can go a little or a long way depending on the user: Blu-ray disc menus often have the “Play / Settings / Extras” graphic along the bottom of a 16:9 frame, while player GUIs such as Oppo’s blue time elapsed bar are at the top. Vertical stretch, of course, annihilates them. Now with zoom mode, bleeding these over the top or under the bottom of a ‘scope screen may not result in a nice image but at least it gets the job done without fuss such as temporarily disabling vertical stretch, and most importantly the user isn’t left wondering where the disc menu is when the menu button is pressed. Congratulations on another skilful treatment of an important aspect (pun intended) of image quality in today’s marketplace. It should also be noted that not all epic/classic/important wide screen movies are 2.39:1. There are several others used on Blu-ray Disc that render anamorphic lens systems insufficient. One example is the recent release of ‘Ben Hur’ in 2.76:1. The BD versions of ‘Alien’ and ‘Aliens’ are both 1.85:1. Another example will be the release this Fall of ‘Lawrence Of Arabia’ in 2.20:1. The most thoroughly elegant solution I know of for dealing with multiple aspect ratios in one’s movie library, while very costly, is Anthony Grimani’s ‘PMI 2.0’ multi-resolution/size/aspect ratio system. A video demonstration of how such a system works can be found at http://www.pmiltd.com. It is essentially a system using a cinema-grade motorized spherical lens and a four-way masking screen. This jumping up and down with lenses, stretching and flattening the image is so last century! The movie producers should just throw their beloved 70mm film equipment into the nearest garbage can and wake up to the fact that significant portion of videos are watched on 4:3 AR iPods (so whatever stuff they put on the sides it would be ruthlessly cut off). Hi Michael…you might have just saved me a few thousand dollars that I can now spend on an oppo or a sub. The write up is good, detailed and logical.